(CNN) -- England enter the final day of the opening Ashes Test in Cardiff battling to avoid defeat, as Australia tightened their grip on a rain-afffected fourth day in Cardiff. 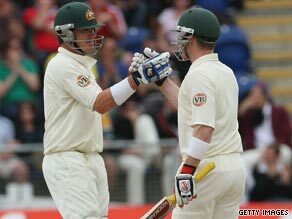 Marcus North (left) and Brad Haddin helped guide Australia to a 239-run lead after day four of the first Test. Resuming 44 runs ahead on an imposing 479 for five, centuries from Marcus North and Brad Haddin guided Australia to 674 for six before they declared 239 runs clear to record their highest Ashes total since being dismissed for 701 at The Oval in 1934 and their fourth-highest ever against England. The tourists then claimed two early wickets to leave England struggling on 20 for two, still trailing by 219 runs when rain washed out any further play at tea. It was the first time Australia had ever had four different centurions in an Ashes innings, and the only time it had been done against England. Left-hander North was claiming his second century in just three Test matches while wicket-keeper Haddin was the driving force of their 200-run partnership, hitting 71 of the 97 runs added by Australia in the 15 overs between lunch and their eventual declaration. Such was the ferocity of Haddin's approach he raced from 50 to his hundred in just 48 balls and by the time he was caught off Paul Collingwood, he had hit 11 fours and three sixes in his brilliant 121. North was the more methodical of the pair and remained disciplined throughout his unbeaten 125, refusing to become tempted by England's consistent tactic of bowling outside his off-stump. England had spent over 12 hours in the field and Australia exploited that situation with left-arm seamer Mitchell Johnson winning an lbw appeal after swinging the ball into Alastair Cook's front pad. Ravi Bopara followed just seven balls later when he also tried to play across his front pad and umpire Billy Doctrove upheld an appeal for lbw from swing bowler Ben Hilfenhaus even though TV replays suggested the ball would have bounced over the stumps. Those two dismissals have left England, who have not won the first Ashes Test in any series since 1997, praying for more weather interruptions as they attempt to bat out the final day and prevent Australia taking an early lead in the series.